Ban on public gatherings, election fraud, Russian citizenship. 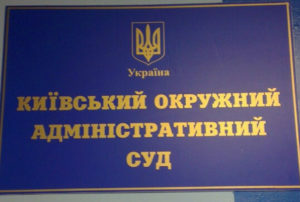 Analysis of the judges of the Kyiv Regional Administrative Court and Economic Court of Kyiv Region – ЧЕСНО. Фільтруй суд! CHESNO.Filter the Judiciary! while working on a database of the profiles of all Ukrainian judges, analysed the “servants of Themis” in Kyiv Regional Administrative Court and the Economic Court of Kyiv Region. In total, these two courts employ over 52 judges: 22 in the Kyiv Regional Administrative Court and another 30 in the Economic Court of Kyiv Region. Out of 22 judges of the Kyiv Regional Administrative Court, 14 (64%) violated the integrity criteria developed by the CHESNO Movement, in particular, adopted political decisions. Out of 30 judges of the Economic Court of the Kyiv Region, four are dishonest (13%). The following judges of the Kyiv Regional Administrative Court are famous for their decision on banning the peaceful assemblies: Lapii Serhii Mykolaiovych, Leontovych Andrii Mykolaiovych, Panova Hanna Valeriivna, Vasylenko Halyna Yuriivna, Zhuravel Valerii Oleksandrovych, Balaklytskyi Andrii Ivanovych and Brahina Oleksandra Yevheniivna. The wife of the judge Basai Oleh Viktorovych has opaque assets. In 2015, her official income amounted to UAH28 million. Although in 2013 and 2014, the wife did not have such a significant income. Moreover, judge Basai and his family together hold more than UAH12 million in cash with about UAH17 million at his wife’s bank account. The residence of judge Lyska Ihor Hryhorovych is also attracting a lot of interest. More precisely, it is unknown whether he or his family have the place to live at all. After all, in his declarations, he did not indicate any real estate. At the same time, he is obliged to declare the property that belongs to him as a judge and his family members as a private property or whether they lease the accommodation or are otherwise entitled to use them. Also, the Kyiv Regional Administrative Court approved dubious decisions regarding the falsification of the election of people’s deputies. The judges Kolesnikova Iryna, Oleh Holovenko and Panchenko Nataliia Dmytrivna were members of the panel that on 9 November 2012, passed a resolution refusing to satisfy the claim of the Batkivshchyna Party to declare as unlawful and abolish the decree of the DEC No. 94 on the invalidation of voting at 26 polling stations. The situation is unique to the judge of the Economic Court of the Kyiv region Chonhova Svitlana. According to the “Nashi Groshi” (“Our Money”) website, judge Chonhova received a passport of the Russian citizen in 2015. It has become known from the website of the Federal Tax Service of the Russian Federation. The Law of Ukraine “On the Status of Judges” confirms that only a citizen of Ukraine can be recommended for the position of a judge. The judge of the same court, Shchotkin Oleh, decided against invalidating the contract between the Private Joint-Stock Company “Plast” and the State Joint Stock Company “Chornomornaftogaz”, which transferred the gas field located on the territory of the Kherson Oblast to PJSC “Plast”. The High Economic Court of Ukraine ruled to cancel the decision as illegal. Also, the Economic Court of the Kyiv region has several judges who provided incomplete information in their property declarations. These are judges Babkina Viktoriia Mykolaivna and Narizhnyi Serhii Yuriiovych.